WPC door board is composite of wood fiber and a variety of PVC resin by extrusion, mixing, plasticizing, forming process, which combines the excellent characteristics of wood and plastics, the finished products can achieve real wood-limitation effect. Green, environmental protection, waterproof, moisture-proof, anti-corrosion, mildew-proof, no deformation, flame retardant, and recyclable, due to no use of glue for raw materials and in the production process, it does not produce formaldehyde, benzene, ammonia, trichloroethylene or other harmful substances. 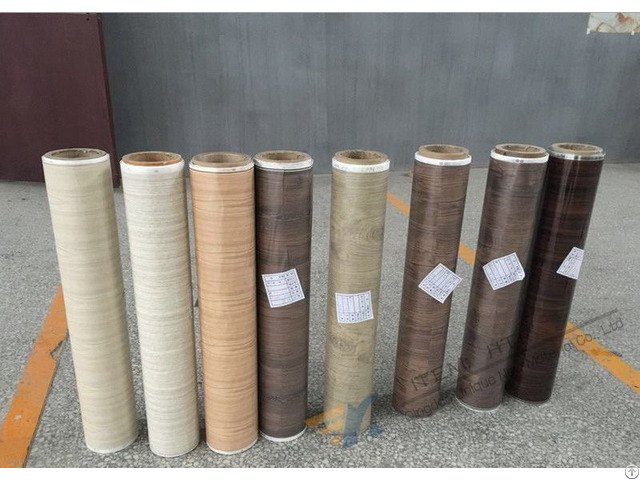 Especially suitable for application in humid environment, suitable for drilling, planing, nailing, sawing, laminating, printing and other wood processing method, especially for those shape which wood is not easy to produce. WPC door board transfer film The production process is using hot stamping equipment to heat the door board heat transfer film for one time, transfer the decoration pattern of hot stamping foil for WPC door panel to the surface of wood plastic composite door board, and finally form high quality decorative film. In the process of heat transfer, the protective layer and the pattern layer are separated from the polyester substrate by the combined action of heat and pressure, and the hot melt glue is used to make the whole decorative layer and the base material permanently glued together. 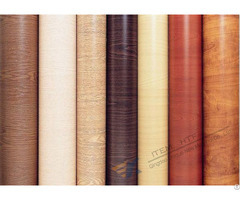 The heat transfer film is composed of PET base film and wood grain decorative layer. The surface is coated with UV protective layer, base color layer, release layer and hot melt glue layer. 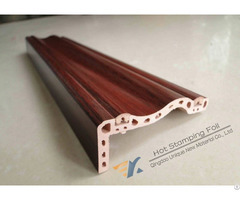 By heating high temperature silicon roller, the temperature and pressure applied to the transfer foil, make the decorative wood grain layer, surface protective layer, base color layer, which totally called heat transfer layer released from PET base film, transfer to the WPC door surface, then formed the decorative pattern on the surface of the door, and the surface has excellent wear resistance, heat resistance and light resistance. The pattern is novel and beautiful, color is stable. WPC door board transfer film Setting of heat transfer temperature: When the temperature is too low, the pattern can t be printed or steady transferred, it will cause broken printing; when the temperature is too high will make the color surface oxidized, cause the product lose luster, color darken, even cause bubbles. To determine the best hot stamping temperature should take the following factors into account: pressure, speed, area, room temperature, etc.. Hot stamping temperature range is normally considered as 140 to 180 Celsius degrees, once the best temperature is set, it should be kept constantly, the temperature difference is kept within 2. WPC door board transfer film Setting of heat transfer pressure: hot stamping pressure is generally 6 - 4 kg/cm2. When the pressure is too low, it can t make hot stamping film and substrate adhesion, reduce the fastness; when the pressure is too high, it will cause the substrate compression deformation increases, resulting in pattern deformation, printing layer thinning. If hot stamping for complicated rough products, more attention should be paid to each pressure spot, uniform pressure, pressure angle requirements of stamping wheel and substrate are even higher, otherwise will cause unstable adhesion for some part. Setting of heat transfer speed: it is decided by hot stamping area, at the same time to consider the power of heating temperature. Firstly set speed, and then set the pressure, and finally set the temperature. 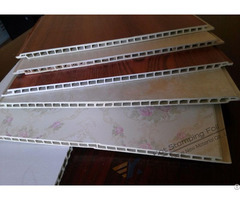 Normal specification for WPC door board transfer film, vacuum-thermoforming transfer film: thickness: 40-50microns specifications: width can be customized, length 500m/1000m per roll, color: wood grain pattern, gold, silver, marble limitation film, and other nostalgic patterns, wood plastic composite door panel transfer film, vacuum-thermoforming transfer film also can develop new color pattern according to the market demand. MOQ: 2000m. Qingdao Unique New Material Co., Ltd The main products are WPC wall panel Heat transfer film, Wood grain transfer foil, WPC transfer foil, floor transfer foil, skirting transfer foil, photoframe transfer foil, door frame transfer foil, wallboard transfer foil, MDF transfer foil, PVC panel transfer foil, transfer foil on the glass, marble foil. Marble transfer foil. The main products of our company are Wood grain transfer foil,Heat transfer film for WPC wall pane, WPC transfer foil, floor transfer foil, skirting transfer foil, photoframe transfer foil, door frame transfer foil, wallboard transfer foil, MDF transfer foil, PVC panel transfer foil, transfer foil on the glass, Marble transfer foil, etc.